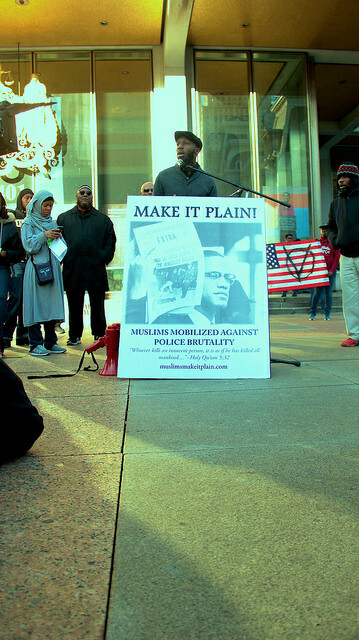 The “Make It Plain-Philly” rally that took place on December 27th, 2014 was as much about the present day circumstances of race in America as it was about the long-term mobilization of black Muslims in America. 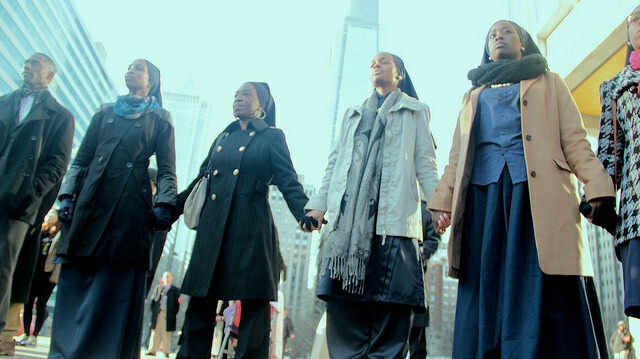 Philadelphia is one of the oldest and most established indigenous American Muslim communities. According to the the Association of Religion Data Archives, in 2010 Muslims made up about 2.6% Philadelphia County’s population, totaling about 40,000. It is the fourth largest Muslim population center, with at least 63 registered mosques. Islam is so normalized in Philadelphia that it is not an uncommon sight to see a hijab-clad black American Muslim driving the city bus or niqab-wearing women in scrubs at Children’s Hospital of Philadelphia. Islam has become deeply embedded in the local vernacular, so much so that many non-Muslims use the term “ock” (derived from the Arabic term akhi which means brother) to refer to Muslims. Even Muslim modes of dress and grooming are adopted by the broader community. It is not uncommon for a non-Muslim to request a “sunni beard” trim from his local barber. Muslims have played an important role in the city’s institutions, a noteworthy example is Kenny Luqman Gamble’s redevelopment project in South Philadelphia. First, Muslims should have a lot to say about racism in America, drawing from the history of black Muslims who have repeatedly articulated powerful critiques of racist social, cultural, political and economic structures. Taking a leadership role in addressing issues of race and racism in America is an important step Muslims in America must undertake that aligns with the moral and ethical impulses of Islam. In other words, Islam has something meaningfully important to add to the conversation, and so participation is both morally obligated and politically necessary. Second, the black Muslim community must take this opportunity to assume a leadership role within the broader Muslim community on an issue important to America. Muslims in general must take an active role in addressing issues of racism and bigotry and black Muslims have unique insights into these issues given its history and experience of Islam in America. In 1985, Philadelphia became the only US city in which a police department bombed civilians, killing 11 people. The Justice Department recently intervened to curb abuses in Philadelphia Police Department. The cases of misconduct included corruption, excessive use of force, sexual misconduct, false arrest, and homicide. Philadelphia Muslims are no strangers to structural racism, over policing and surveillance. The NYPD’s spy program includes surveillance of UPenn MSA students. A few years back, an APB was issued by police for my husband, Marc Manley, for taking a picture of train tracks while wearing a fez. Likewise, black Muslims are not immune to the vulnerability of black Life, as the Philadelphia community was reminded of at the janazah of Aisha Abdul Rahman. 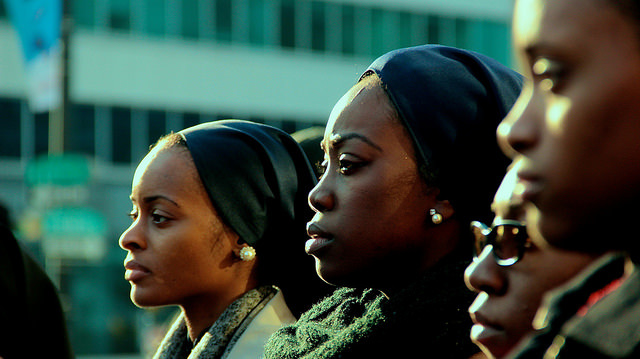 Black Muslims are all too often victims of gun violence. With the intersection of race, Muslim identity and policing in Philadelphia, the spontaneous efforts Philadelphia Muslims to organize “Make It Plain” was a necessary response by a community that needs to make it presence known. One of the most powerful statements of the rally was the presence of black American Muslim leadership. The organizers have decades of experience fundraising, community building, writing, and supporting the community. We are witnessing increased solidarity within the Muslim community. We are hopeful that discussions about race happening in Muslim circles across the country. But we have many hurdles to overcome in order to make long term and sustainable changes. Some black American Muslim leaders from the Black Power movement have expressed skepticism about the efficacy of our actions. Some traditional Muslims don’t believe that protest even has a place in Islam. We have to be vigilant about exercises of privilege from our non-black allies within the Muslim community, which can derail important conversations or deflate the momentum. It is absolutely necessary that we train our non-black Muslim allies in privilege and anti-racism in order to prevent patterns of paternalism or speaking over inner-city black Muslims. We also need to develop trainings for marginalized groups and youth so that they can have the tools and vocabulary to challenge attempts to silence them. Kameelah Mu’min Rashad, a prominent Muslim activist in Philadelphia, spoke of this rally as a call to action for Muslim community leaders and members to unite and take a stand for police accountability and racial justice. “We must put faith into action and take a stand against oppression, whether by seeking to remove it with our hands, speaking against it, or by hating it in our hearts. We are calling on our brothers and sisters to stand, speak and act! When I asked Kameelah what stood out most, she replied by pointing to a picture of a young boy holding a megaphone during the march, referring to the participation of our children. “Bring our children with us so that they will be part of this legacy. It is an ongoing struggle, a generational struggle.” She continued, ” this is not just talk. This is their inheritance as Muslims as black people as Americans”. The rally was held at LOVE park at 15th and JFK Boulevard at 12pm. The line up included, Tanya Dickerson, Brandon Tate-Brown’s mother, author and poet Seff Al-Afriqi, author and poet, writer Shahidah Mohammad, and keynote speaker Imam Abdul Malik. All faiths are welcome. Make it Plain is a group of concerned Muslims who are working to raise awareness to encourage, inspire, and support the mobilization of the Muslim community to respond to police brutality and the conditions that bring about the over policing of the Black/African American community. We are kicking off this movement in Philadelphia. For more information, visit the site muslimsmakeitplain.com. You can also visit the Facebook Event page. 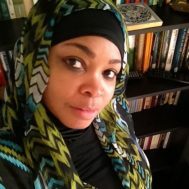 Margari Aziza Hill is a co-founder and Programming Director of Muslim Anti-Racism Collaborative.